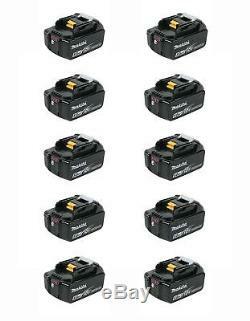 Makita BL1850B 18 Volt LXT Lithium-Ion 5.0Ah Battery, 10 Pack. The Makita 18V LXT Lithium-Ion battery charges faster and works longer than standard lithium-ion batteries, giving you and your cordless tools unmatched performance and productivity to take on the most demanding applications. The Makita 5.0Ah battery, model BL1850B, combines more run time (65 percent more run time per charge than the Makita BL1830 battery) with a category-leading charge time of only 45 minutes so it spends more time working and less time sitting on the charger. For added convenience, it also features an on-board L. Charge level indicator to monitor battery charge. Provides up to 65% more run time per charge compared to BL1830. Battery charge level indicator allows user to monitor battery charge. Reaches full charge in 45 minutes or less. Battery delivers consistent power and run time in extreme temperatures, even in winter. Equipped with Star Protection Computer Controls to protect against overloading, over-discharging and over-heating. Impact-resistant outer case and shock-absorbing inner-liner are engineered to protect the battery. Sixteen contact terminals maintain a constant connection with the tool to help prevent power loss or fluctuation, even during high-vibration applications. Battery resists self-discharge and remains ready for use even after long periods of storage. Makita 18V Lithium-Ion is the world's largest cordless tool line-up powered by an 18V Lithium-Ion slide-style battery. Full Charge Time: 45 min. This information is provided by the carrier and excludes weekends and holidays. Note that transit times may vary, particularly during peak periods. MAKUS-10E Standard Listing - 01 MGT0504. The item "Makita BL1850B 18 Volt LXT Lithium-Ion 5.0Ah Battery, 10 Pack" is in sale since Friday, December 21, 2018. This item is in the category "Home & Garden\Tools & Workshop Equipment\Power Tools\Batteries & Chargers". The seller is "hardware_sales_inc" and is located in Ferndale, Washington. This item can be shipped to United States, all countries in Europe, Canada, Australia, Bahamas, Viet nam, Uruguay.